There’s comfort in routine. While it can add stability and ground us, routine can also stall and numb our senses. Be spontaneous regularly – I can’t say when or where because that wouldn’t be spontaneous now would it. Try something new – in small, medium and large ways. A simple shift now and then to keep your days fresh and you feeling refreshed. Be curious, dance without music (alone might be a good idea), try a different restaurant, skip through the office, play hopscotch in the parking lot, take a last minute trip (Vegas a few weeks ago with my parents and brother), start a new hobby (friends started winemaking) or fly a kite (saw that on our run today). 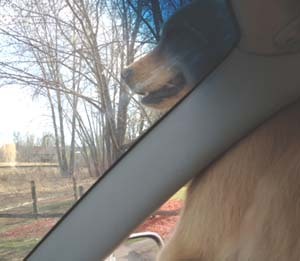 Lily highly recommends putting your head out the window to feel the exhilaration of the wind in your face. And while you can be spontaneous by yourself, it’s fun to bring someone along for the ride, break out of the routine and to see the world in a new light. Lily enjoying a little breeze in her face outside the car window. Nice post. Love the picture of Lily. Thank you! Inspirational post. I’ll try it!